When you are visiting a foreign country, are you aware of the differences beside the language? Travel guides help us describe these sometimes subtle nuances, but there’s more to it. When my parents visited Hungary they met with a long distance friend of us. They caught up and exchanged some small regional gifts, as you would do too when showing the best of your country to a foreign friend. The Hungarian gifts, some marzipan and ox bouillon are on the kitchen closet now and I wonder how long they would stay untouched. It reminds me of all times I introduced foreign visitors (eg. colleagues and consultants) to the Belgian mattentaart (literally translated as ‘carpet pie’), Belgian beers and other stuff. Convinced that it was the best they could ever taste. We are at the verge of cultural differences here. And it only starts with the food and beverages. The way you shake hands and say hello, the way you engage in conversation, the way you give feedback etc are few examples of how cultural differences express themselves. When things at the office in another country do not work and you’re pulling your hair like: “We tried everything and we don’t understand why they don’t get it!“, it’s probably a cultural thing. While being aware of it isn’t enough, you really should (learn to) work with it. Study the culture and its differences before diving in. Start on a good foot, instead of an insult you’re not aware of. These cultural differences can exist in other countries, but also in other parts of your organisation, even in the same building. While you can prepare for visits to foreign countries (see further), preparing for other in-organisation ‘foreign’ cultures might just being you taking a visit to the department and experiencing it. You can ask the employees and take a look from a distance to observe the process. Consider yourself as a new employee. When we are going to foreign countries we use the Geert Hofstede cultural index to get insight into the country’s culture. Hofstede defines culture as the collective mental programming of the human mind which distinguishes one group of people from another. Power distance. How is power distributed and how do they handle inequalities? For example, can you walk into the boss’ office when you want or is that not done? Individualism vs collectivism. Are individuals expected to care for themselves or is there a ‘we’? Masculinity versus femininity. 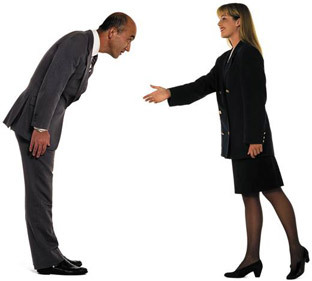 Is achievement and assertiveness (masculine) appreciated, or are cooperation and modesty appreciated (feminine) (remark: non-exclusive summary of traits). Uncertainty avoidance. How do they deal with uncertainty and ambiguity? For example, is the organisation open for ground breaking innovative ideas or are the rather reluctant? Long-term versus short-term orientation. Do they adapt to change circumstances or is it more important to respect traditions? Indulgence versus Restraint. Is the culture focussed on joy and fun, or is it rather limiting it? Remark: the descriptions here are very short. A full explanation can be found here. 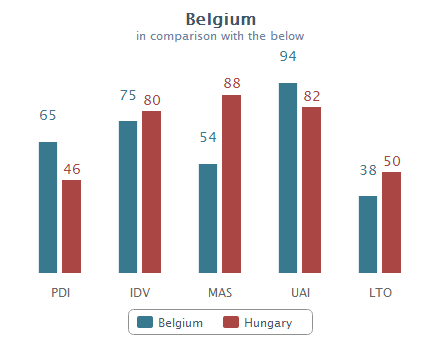 Power distance: Belgium gives more importance to hierarchy and a formal approach. In Hungary there’s only hierarchy for convenience, employees like to be consulted and control is disliked. Masculinity: Belgium is more feminine than Hungary, so more attention goes to care and quality of life, instead of competition and achievement. Hungary is more masculine which implies that managers are expected to be decisive and assertive. Conflicts are fought out. Long Term Orientation: Belgium is short-term oriented which implies respect for norms and a business focus on quarterly results. Hungary is more long-term oriented which shows the ability to adapt their norms & culture to a modern context. There’s no need to judge: there’s no right or wrong in cultures. A culture is not decided and taken in over night: it has steadily grown and developed over the years. But it can be very handy to be aware of these sometimes subtile differences.